Need to practice your butterfly knife skills and still maintain the perfect look? With these practice butterfly knives, you can show off your latest tricks and your latest haircut. These "BaliCombs" are designed by famous Filipino Barbers and are designed exactly like a high quality butterfly/balisong knife, but with a steel comb for the blade. They are weighted very similar to other butterfly knives this size, have a smooth operation, and quality torx screw construction ensuring a sturdy build so that they can be put through a beating when training. 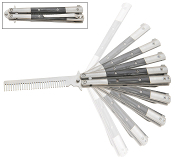 The steel comb resists breaking and bending for many years.